UNL physicist Aaron Dominguez leads collaboration involving eight universities to upgrade the Compact Muon Solenoid particle detector, a key component of the world’s largest physics experiment. The illustration shows an event, captured by CMS in 2012, that provides evidence of the Higgs boson. The world’s largest atom smasher has proved invaluable at answering fundamental questions about the nature of the universe, including finding the Higgs boson, but much remains unknown. A team of UNL physicists and collaborators at eight U.S. universities have received a five-year, nearly $11.5 million grant from the National Science Foundation to increase the effectiveness of a vital component of the supercollider that made the Higgs discovery possible. Built by a global collaboration of physicists, the Large Hadron Collider at CERN laboratory in Switzerland propels two high-energy particle beams in opposite directions around a 16.6-mile ring of superconducting magnets. Seeing what happens when the two superfast-moving beams collide gives scientists important insights into the basic building blocks that make up the universe. The UNL team was part of the multi-institutional collaboration that built the original Compact Muon Solenoid (CMS) experiment, one of two large particle detector experiments at the Large Hadron Collider. With this new NSF grant, they now lead a large research partnership to upgrade the detector in stages through 2019. Their collaborators are at the University of Kansas, University of Illinois at Chicago, Rutgers University, Cornell University, SUNY Buffalo, Purdue University Calumet, Notre Dame University and Northeastern University. Capturing images of the explosion requires an enormously powerful digital camera, or pixel detector. UNL’s role is to build new modules for the pixel detector that will be capable of taking 40 million images a second at a total resolution of more than 120 million pixels. Consumer digital cameras top out at about 12 million pixels. The images are used to create a kind of movie of the particles’ paths in less than 10 micron increments. Their university partners are upgrading the CMS Hadron calorimeter and trigger system, as well as assisting with aspects of the pixel detector. The calorimeter measures the energy of hadron particles, such as protons, which helps detect if new particles were formed during the collision; the trigger system is a sophisticated method to capture the relevant data out of the billions of interactions that occur within a collision. “This grant is an outstanding example of UNL providing leadership and expertise in international science that is leading to new discoveries,” said UNL Chancellor Harvey Perlman. Though often called the “theory of everything,” the Standard Model is far from complete, Dominguez said. It doesn’t address important phenomena such as gravity, dark matter or the even more mysterious dark energy. UNL also is one of seven U.S. CMS Tier-2 sites in the Worldwide Large Hadron Collider Computing Grid that processes and stores the unprecedented volume from this massive research project. This grid combines the computing power of more than 140 independent computer centers in 34 countries to analyze results from the supercollider’s experiments. UNL physicist Ken Bloom is project manager for the U.S. CMS Tier-2 sites and co-coordinator for Tier-2 sites worldwide. The university’s Holland Computing Center provides Nebraska’s supercomputing horsepower for this project. In addition to Dominguez and Bloom, UNL’s high-energy physics team includes physicists Dan Claes, Ilya Kravchenko and Gregory Snow as well as computer scientist David Swanson, Holland Computing Center director. 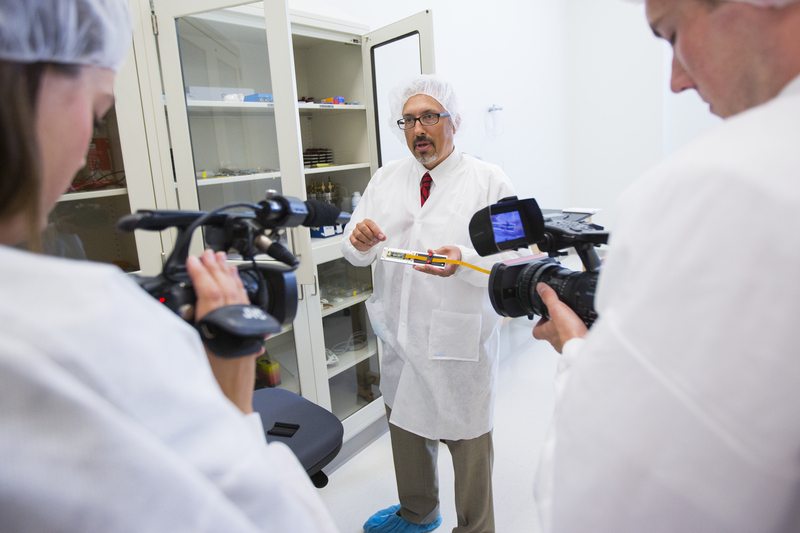 Dominguez watches as media film particle detector chips in the High Energy Lab in Jorgensen Hall. Dominguez shows a prototype particle detector chip to local media during a tour of the High Energy Lab in Jorgensen Hall.